MaChatte is a very busy cat. She has a lot to do, all the time. MaChatte means my cat in French, tho I am her person just as much as she is MaChatte. 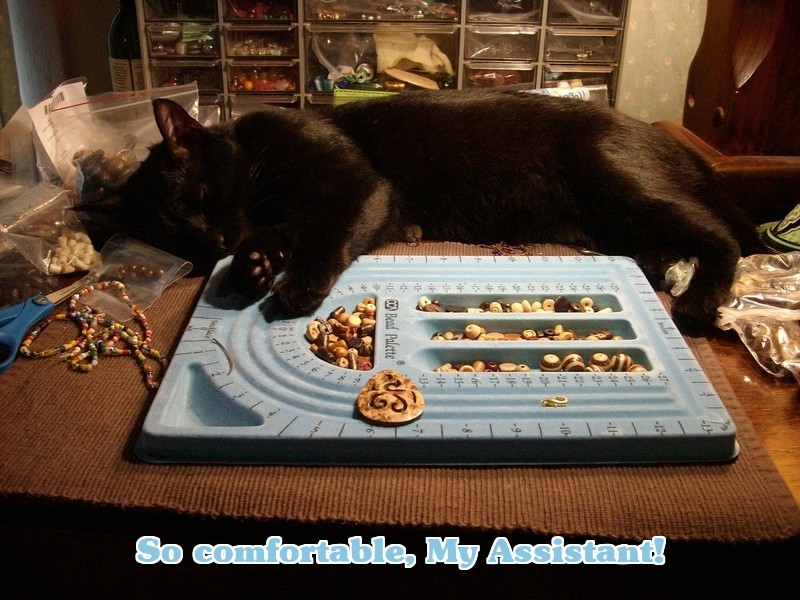 Here’s another picture of her asleep on the job…….she was studying some Tribal components I had laying there, as I was working with some wood beads and African trade beads. Then she fell asleep. There are some wonderful Ghana Christmas beads there beside her too, I like those! It was her nap time! Her favorite thing in the world is a 2″ long bird my son got her for Christmas. It used to sing as it flew thru the air. She was scared to death of it for the first 2 days. Then she decided she had to conquer that fear…….and she attacked! Over and over to the point that the bird unfortunatley has no tail or wings left. And in her attacks, I’m afraid the poor bird suffered internal injuries that cost him his voice. But, he’s her favorite thing, and she likes him so much that he goes under the couch a lot, and then I have to get the yardstick and dig him out. So, who’s trained here……….? Recently she got a new bed. It has a bone on the front, but was called “animal bed”, but it’s pink and cozy and she’s a girl, so she likes it and doesn’t care about the bone. She likes it best when I put some fresh catnip in the corners. 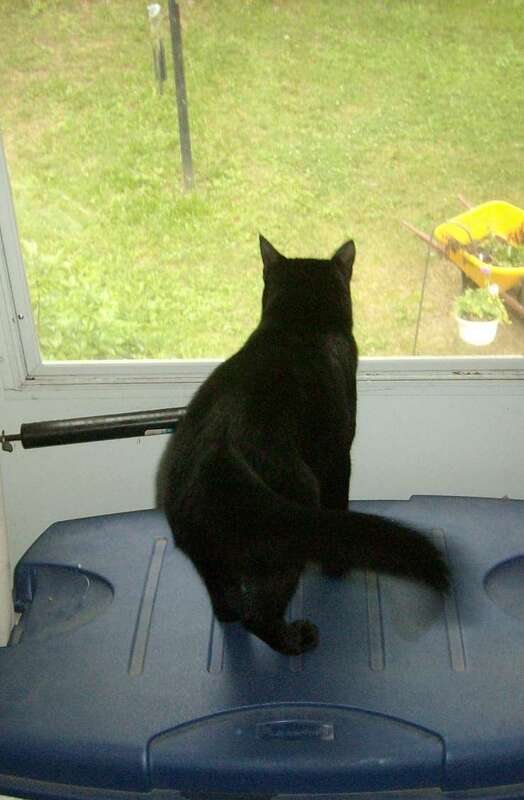 Now it’s summer and one of her favorite places is sitting looking out a second floor balcony door. She can see up in the trees and down to the ground both. MaChatte is a year old now and has settled down a little, but she is still a VERY busy cat! A very busy cat, she has a lot to do! LaChatte is beautiful. I’m sure she keeps you happy. Thank you so much for featuring my Obi on your blog. Enjoyed reading your entries as well. You’re welcome. That Obi is so gorgeous! Glad you like the blog. Adorable! I love the picture with the bead tray! Thanks! She is quite the cat. Every new day is a whole new set of adventures for her. Such a good company and such good entertainment! 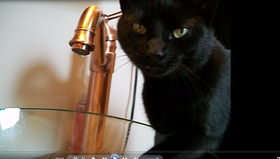 I have a black cat too! 🙂 (and a tabby..) MaChatte is beautiful! Thanks. She is, and I tell her often. My vet says that he thinks black cats are different in some way other than their color: people always make comments about them having large personalities, so interesting, crazy, dynamic. He says people don’t make comments like that about other cats. So we picked some good ones, the lively ones that make our lives interesting having them as companions. 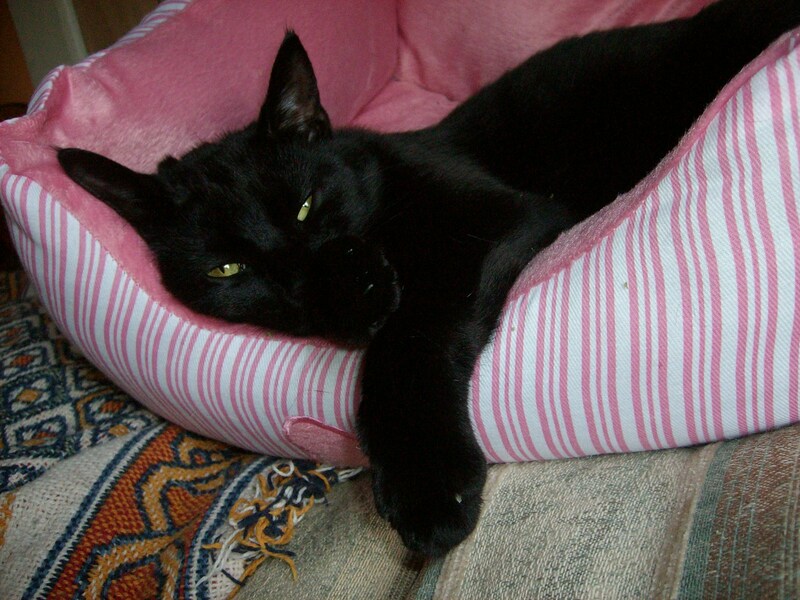 We have a green-eyed black cat we call Mistah … a perfect match for your Mah Chatte! He was a kitten dying of starvation, but doing his best to get help when we first met him. It took two days and most of a tin of salmon to encourage him to come home with us! He has certainly brightened our lives! Aww, bless your hearts for trying so hard to get him to trust you so he could go home with you to a good life! That bed looks pretty cozy, a nice place for a nap. I love the cats! and all the other animals!!! Awwwww MaChatte is just BEAUTIFUL. :). I am someone who ADORES Cats too, :). Thanks and thanks for visiting! She is beautiful, and I tell her all the time. 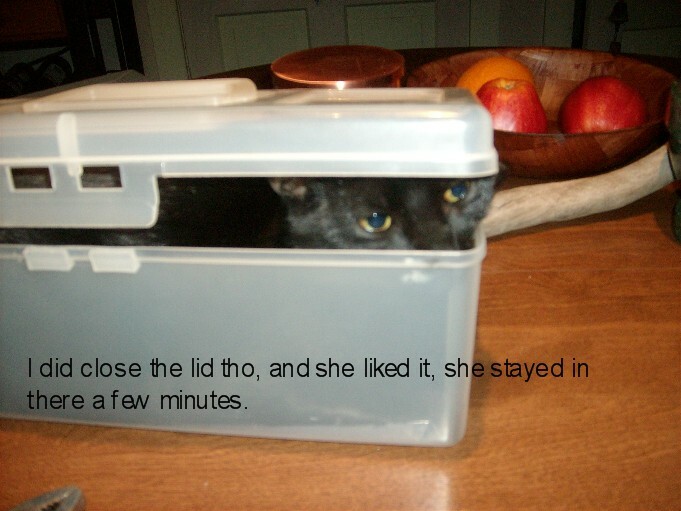 She doesn’t seem to care tho, she just goes on about her cat business. Ahh, a very handsome cat! She thanks you. She has looks and personality both. Our female cat (Anika) had a favorite toy also. It was a little stuffed alligator that she liked to carry around the house, hanging out of her mouth. I think it was her adopted “baby,” because we would occasionally find it in the strangest places. One day we found it floating in the water bowl (getting a drink I guess)–and then later we found it lying in the middle of her food bowl. We couldn’t stop laughing the morning we found that poor stuffed alligator sitting all alone in the litter box. She was such a good mom, making sure that all of its needs were met! Unfortunately, after floating in the water bowls, lying in food bowls, and spending time (repeatedly) in the litter box—her little alligator got pretty ragged looking. But she loved it so! I have found birds in the water and food dishes, never in the littler box tho. She often comes running and talking about a bird, with one in her mouth, to present it to me, sometimes at 2 AM. Your cat was a good mother and did take care of her baby alligator. Aren’t they interesting; each with their own personality and ideas. She must have been a joy to you and your family. She said thank you, lol. She doesn’t lay in her pretty bed anymore for some reason, just lays wherever she wants. Her best spot to spend time is on a kitchen windowsill where she watches birds and squirrels that we feed out back. Yes they are, funny and fun! I had a black called Hamlet. He had so much intelligence and humour. He used to pick pink hibiscus flowers from a tree, and bring them inside to us! Also, he retrieved a ball (a small one) just like a dog.